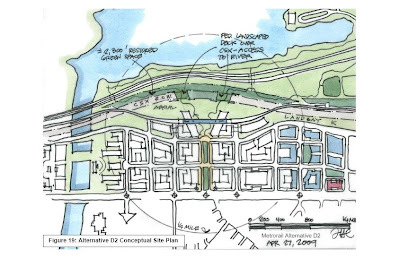 A new group of presentations were given the other night to the Potomac Yard Planning Group. 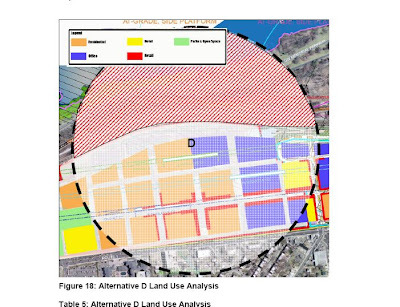 In addition to updates on the analyses regarding limitations facing the project because of restrictions on development in the walk-shed either due to FAA clearance regulations or NPS easements, this new set of documents fleshed out some of the impacts on vehicular traffic. First, there's the series of issues we've already discussed here. 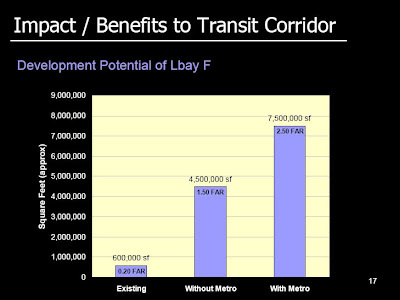 But also now being incorporated into the discussions are some analyses of how development decisions will impact the ability to pay for a station. The group also received this primer on the principles of development economics. 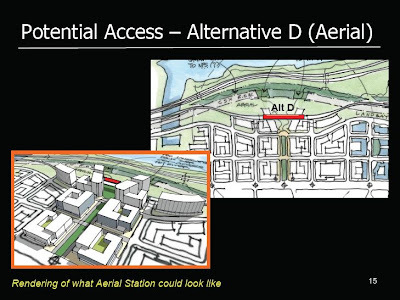 Also there was some more detail fleshed out regarding how the Metro stations could be incorporated into new development and a new version of the northern aerial location option (Alternative D). The newest material included analyses of traffic over the long-term under the various scenarios. 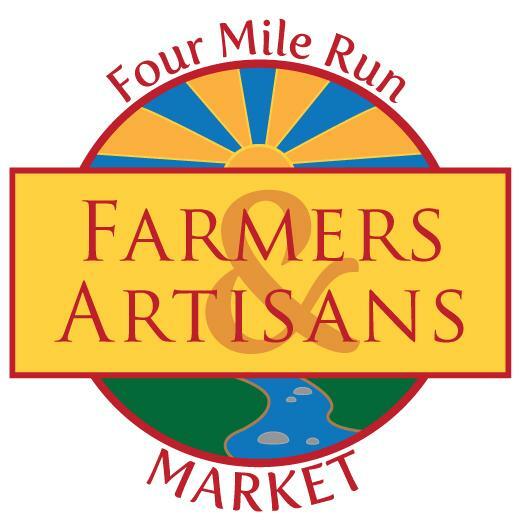 Over time, the vehicular transportation network will steadily approach capacity and traffic delays will increase on major roadways such as US 1. 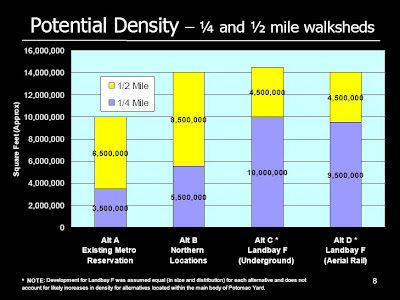 Regardless of whether and at what density Potomac Yard is developed, US 1 will reach its vehicular capacity. If Alexandria and other local trips do not use available road capacity, then regional trips will consume the available capacity. 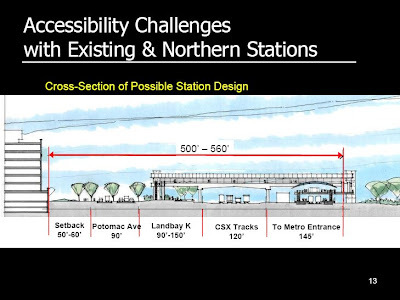 The investments in the multimodal transportation network that are already planned will create substantial people movement capacity to accommodate increases in travel demand associated with continued development in Alexandria as well as in Potomac Yard specifically. 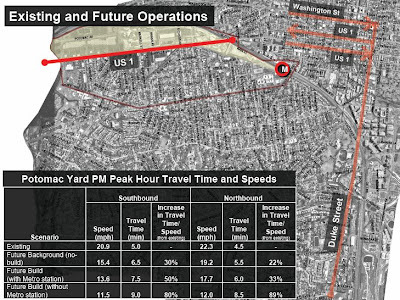 Additional development in Potomac Yard will contribute to increases in traffic congestion at some intersections and reduced travel speeds in major road corridors. 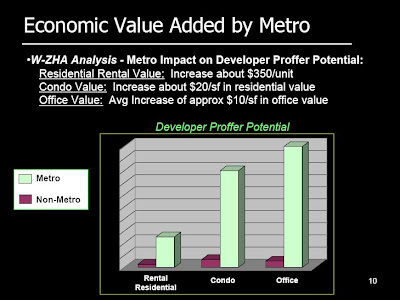 Redevelopment will provide immeasurable benefits to the urban environment and the multimodal transportation system in addition to strengthening the city’s argument for the addition of a Metrorail station to serve Potomac Yard and nearby neighborhoods. Reducing how much we drive.